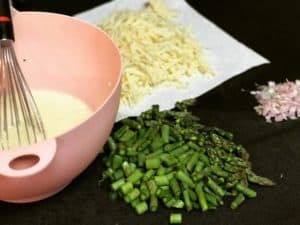 This Asparagus Gruyere Quiche is one of my favorite dishes to make on holiday mornings or any morning…just because. It is decadent, rich and so yummy. Guess what…it’s super easy to make! I’m not a baker, so I do cheat a little and buy a frozen Pillsbury Deep Dish Pie Crust. 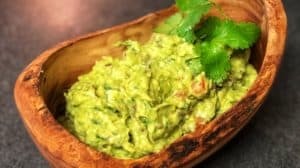 This recipe is also perfect for a bridal or baby shower. Consider buying mini pie crusts to prepare as an appetizer. 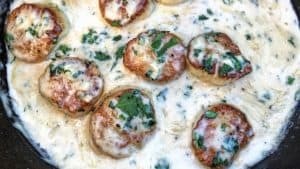 I promise, you and your loved ones will love this recipe, they will be begging you to make it once a week! Preheat your oven to 350 degrees. 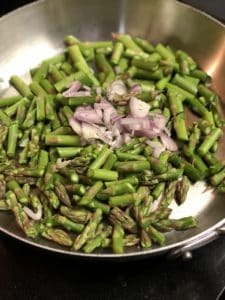 Cut your asparagus into 1″ pieces. 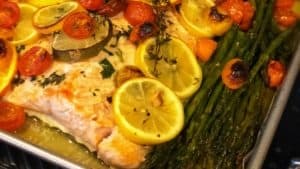 Heat the olive oil in a pan. Add the asparagus and shallots. Season with just a touch of kosher salt. Saute until just slightly tender…about 3 to 4 minutes. Do NOT brown. 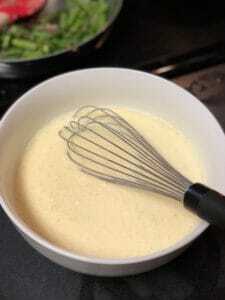 In a bowl, whisk the eggs, heavy cream and pepper. Remove your pie crust from the freezer. Line the bottom with about 1/3 of the Gruyere cheese. Add the veggies. Pour the egg/cream mixture on top. Add the remaining cheese and bake for about 40 to 45 minutes. Cheese will be brown…test with a knife in middle to make sure egg is fully set. ENJOY! 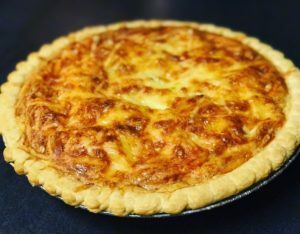 As long as you use the recipe for the egg/cream mixture…you can make this quiche with whatever ingredients you like…if you use sausage or bacon, I would suggest cooking them first! Want a mini-crustless version, click here for my recipe for Mini Crustless Quiche!